As the train was rushing towards Zermatt passing through the beautiful Matter Valley, my mind was swirling with anticipation. I had been fantasizing about this tiny village at the foot of the Matterhorn ever since we began planning our scenic train travel in Switzerland. Zermatt has the reputation of being one of most beautiful ski resorts in Europe. The playground of the rich and famous! I couldn’t wait to see if my high expectations of this place were justified. If indeed there were so many interesting things to do in Zermatt to justify the town’s great reputation. Zermatt is a car-free village, which is not very unusual in Europe. Private cars can only drive as far as Täsch and the last 7 km must be travelled by train or by taxi. If you never experienced a car-free town, Zermatt could be a bit of a surprise. All vehicles in town are electric and almost completely silent. For me this was a bit scary because I could never hear them coming. Cars always snuck up on me! So beware, visitors! Taxi drivers in Zermatt assume that pedestrians have eyes in the backs of their heads. The village is relatively small, with only 5 or 6 streets, so you can walk almost anywhere. As you exit from the train platform area, there are electric cabs waiting in front of the station. Many of the hotels though have porters who will meet you at the station with a small electric car and will take you to the hotel. 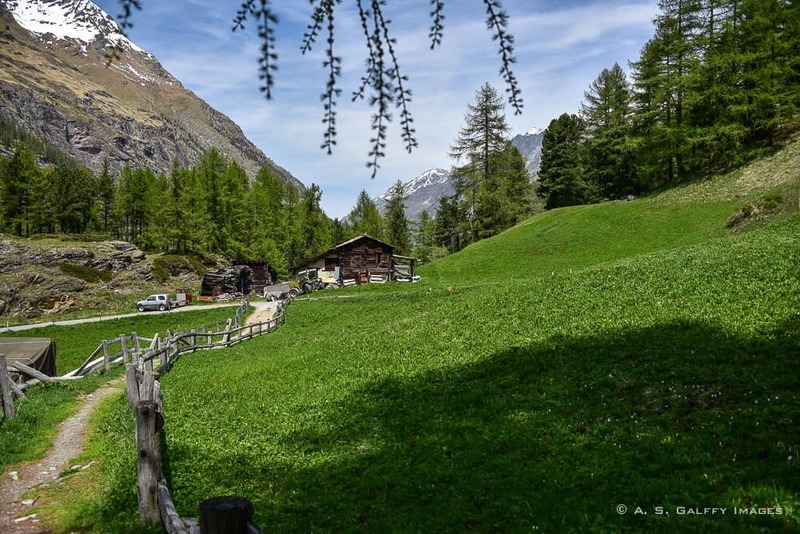 Zermatt is an outdoor lover’s paradise! Skiing is without a doubt the number one attraction in Zermatt, especially since it can be done almost year-round. But besides skiing, this area is a paradise for hiking, cycling, or mountain biking as well. Gorgeous mountains, crystal clear lakes (with the Matterhorn reflected in three of them), and views that can’t be beaten! There are hundreds of trails and biking routes to choose from. And if you want to mountain bike, bikes may be carried on most of the ski lifts that are open in the summer. 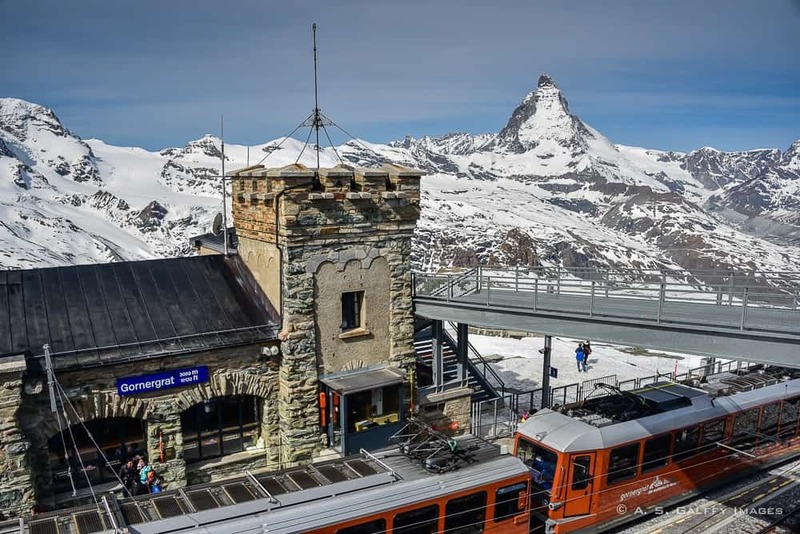 One of the most exciting things to do in Zermatt is taking a train trip up to the Gornergrat. Sitting at an altitude of 3,089 m, the Gornergrat is a rocky ridge of the Pennine Alps overlooking the Gorner Glacier, just south of Zermatt. From the sunny viewing platform of the Gornergrat you can enjoy one of the best panoramas in the Swiss Alps. And what’s great is that this platform is accessible year-round. 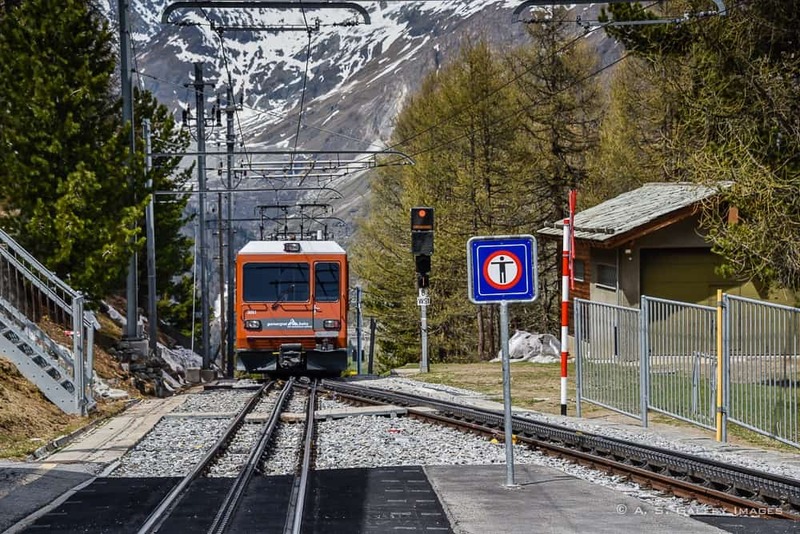 To get there you have to take the Gornergrat Bahn, Europe‘s highest open-air cog railway that has been running since 1898. The trip is an experience in itself. Every second of the 33 minutes ride is an unforgettable pleasure, with dazzling views of 29 mountain peaks, from the Matterhorn to the Monte Rosa. The story of St. Mauritius church is rather awkward. The church that you see today actually replaced an old church dating back to 1587. Initially the people of Zermatt did not want a new church at all, but eventually the community voted for an ambitious new project. At the beginning of World War I, the construction stalled and it wasn’t until 1932 that it was finally been completed. The church was repainted over the years, so the mural paintings and the ceiling are more modern. Because if its good acoustics, St. Mauritius is a regular venue for the classical concerts of the annual Zermatt Festival which takes place each September. 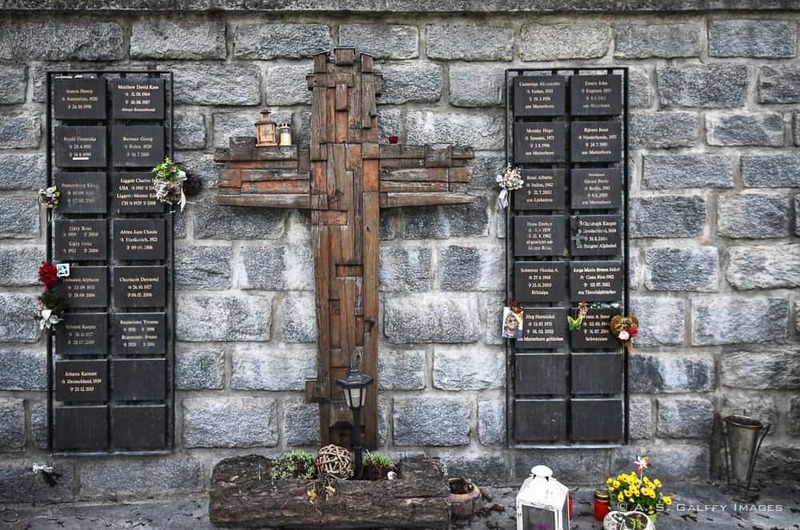 After seeing the dreadful Matterhorn, most visitors of Zermatt feel compelled to visit the Mountaineers’ Cemetery, a sad reminder of the many lives lost in the mountains around Zermatt. The only exception is the grave of Peter and Peter Taugwalder (father and son), that commemorates the two climbers from the first ascent of the Matterhorn, who actually died of natural causes. Located in the yard of St. Mauritius Church, the cemetery is comprised of 50 graves dating from the 19th century and early-20th century. Some of the tombstones reveal the causes of accidents (an avalanche, a rockfall). Most of these deaths occurred on the way down the mountain. It’s surprising to see graves of men and women from all over the world, not only Switzerland. One of the headstones is that of a 17-year old American from New York who died in 1975 on the Breithorn. His epitaph reads: “I chose to climb.” The stone is adorned by his red ice axe along with the US flag. Visiting the cemetery is a sad a humbling experience that may help you understand Zermatt a little better. Across the street from the Mountaineers’ Cemetery, in the locals’ cemetery, there is another memorial dedicated to the accident victims in recent years. 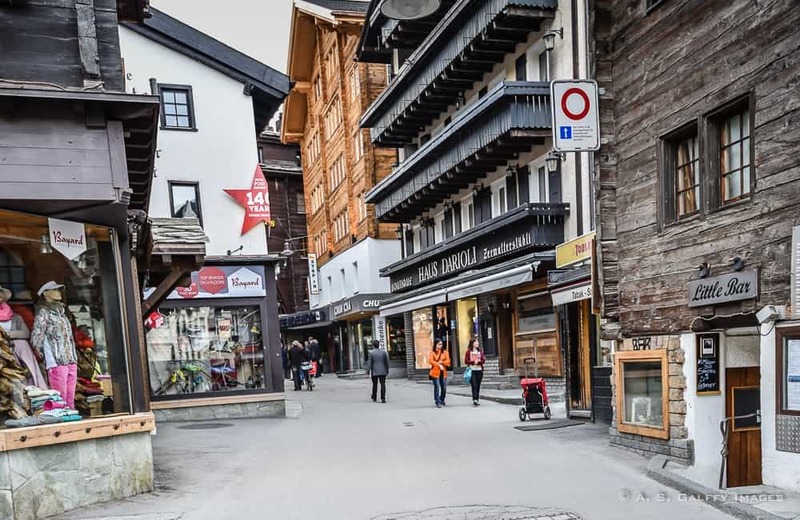 Shopping may not be on your list of things to do in Zermatt, but the abundance of appealing stores on Bahnhofstrasse will take you by storm. This place is a world-class shopping temptation pretty hard to resist! From watches and fine jewelry, fancy clothing and sports equipment, to chocolate, cheese and souvenir shops, you will find almost anything. The sports jacket I bought in Zermatt, still turns heads today wherever I go. The quality of Swiss merchandise is very obvious in almost everything they sell. 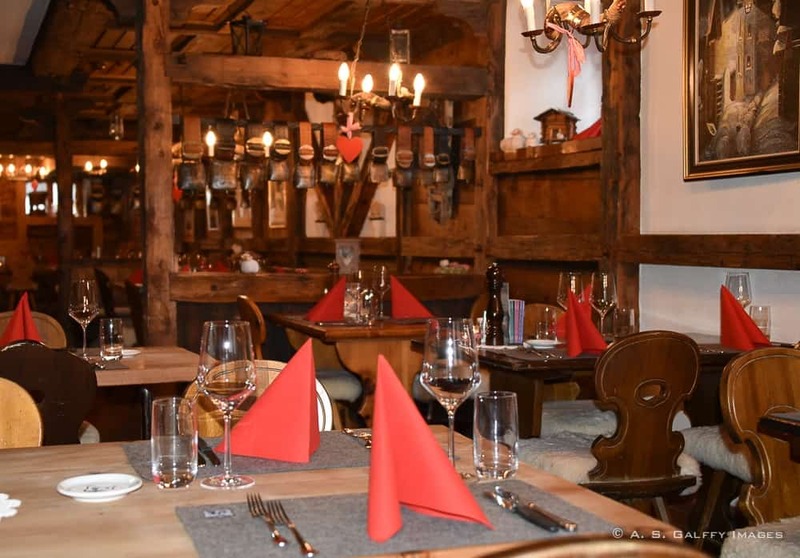 There are over 100 restaurants to choose from in Zermatt. And that is in addition to the mountain restaurants, the bars and the nightclubs! They serve a wide range of food, from traditional Swiss, to Chinese, Japanese, and Thai. 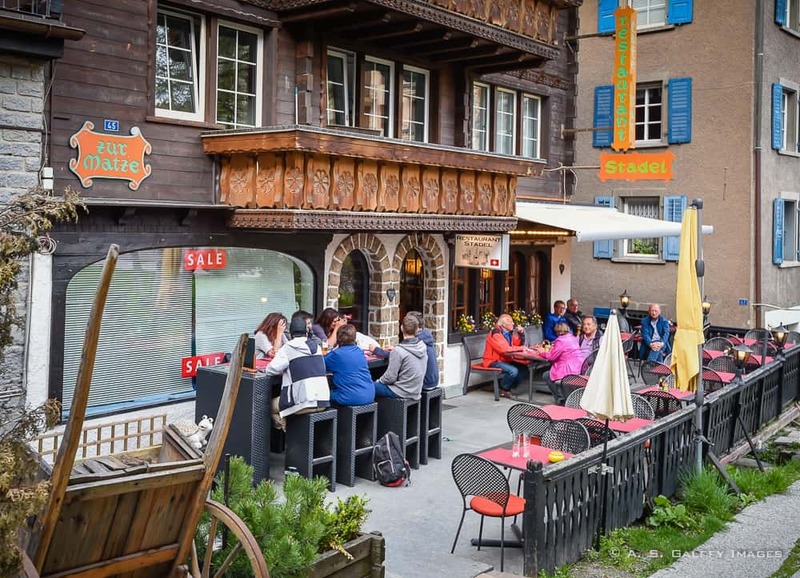 Most of the restaurants in Zermatt are located on the main street. Also, almost every hotel has a restaurant that is open to the public, and some of them are exceptionally good! We checked out some of them, but we were after those serving traditional Swiss specialties. Of of these, there are two that stood out. One of them is Ross-Stall Restaurant, which serves great Swiss food. 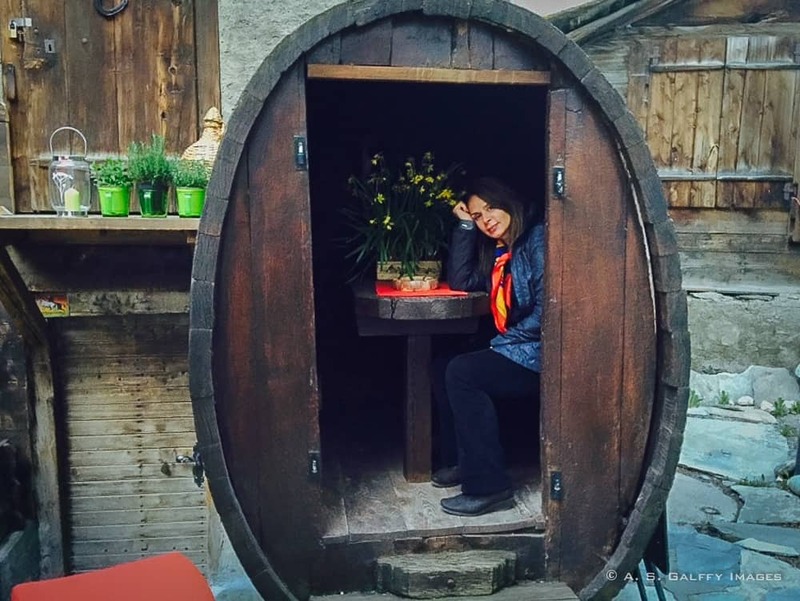 This restaurant will always remain stuck in my mind for its unique patio décor and a mouth-watering delicacies that I haven’t tried anywhere else in Switzerland. 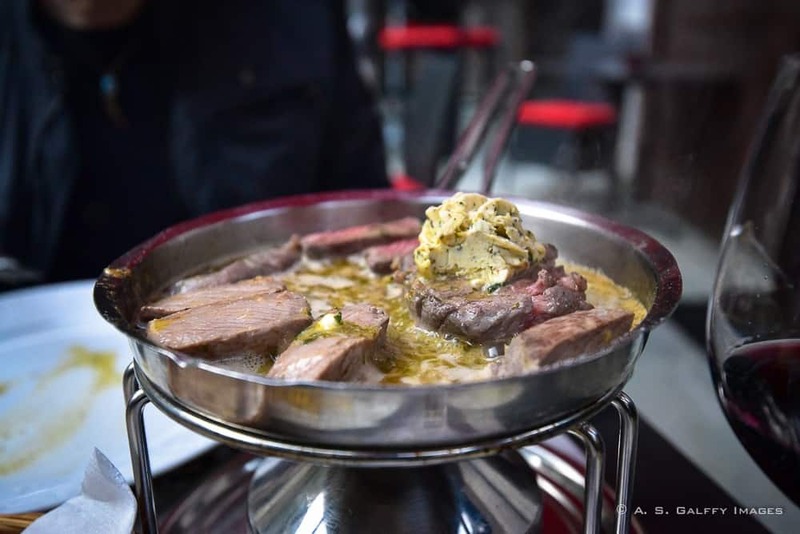 They have an amazing raclette and a mouth watering lamb loin, ternder and perfectly cooked in butter. But don’t try that if you care for your waistline! The other one, the tiny and wonderful Schaeferstube Restaurant located downstairs inside Hotel Julen, where we have been invited by Amadé Perrig, the former president of Zermatt Tourist Board. We were enchanted by the dishes we tried, mostly Swiss-style, with venison and lamb featured prominently. The lamb comes from the adjacent ranch, where the owner raises the lambs. The canton of Valais is home to two very unique breeds of domestic animals that I haven’t seen anywhere else. One is the Blackneck goat and the other is Blacknose sheep. So if you are ever in Zermatt, try to look for these cute and unusual breeds on the hills around town. 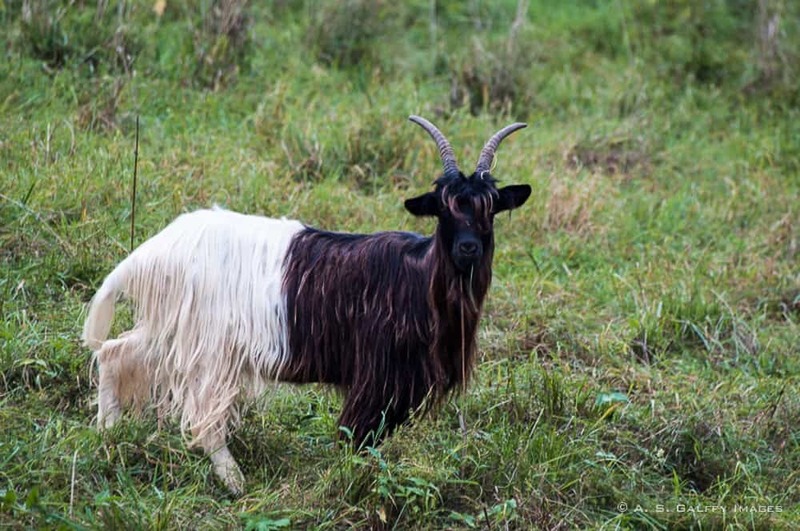 The Valais Blackneck goats (also called glacier goats) have a very distinctive coloring: black from the nose to behind the shoulder and white from there to the tail. Because they don’t produce much milk, back in the 60s the breeders stopped breeding them so they were almost extinct. But today, due to their growing popularity among the visitors of the area, these goats are once again produced in Switzerland. 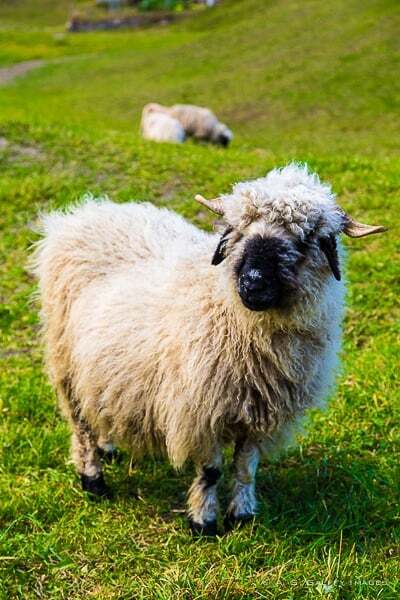 The Valais Blacknose sheep are raised for meat and wool. Their characteristic are the black patches on their nose, eyes, ears, knees, hocks and feet. They have a very light, wooly coat that makes them look extremely cute and are good at grazing on steep, rocky slopes. Zermatt is considered a very expensive destination. It’s probably not more expensive than other places in Switzerland, or other fancy ski resorts around the world. Hotel rooms cost anywhere from $300 to a staggering $2100 per night at five star properties in high season. It’s difficult to find any lodging below $200/night, even if you go off season. 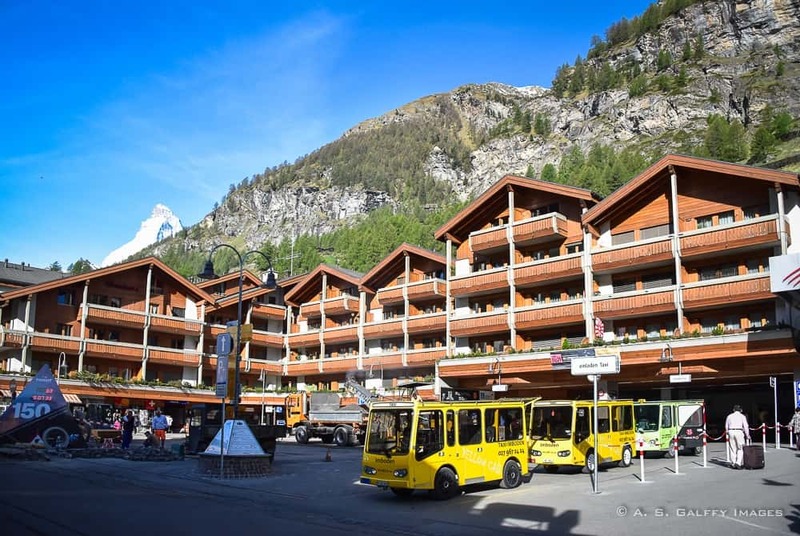 More than half of Zermatt’s hotels are clustered around the main street, Bahnhofstrasse, that extends south from the train station for about half a mile. There is also another batch of hotels beyond the river and the some others in the outskirts of the town. 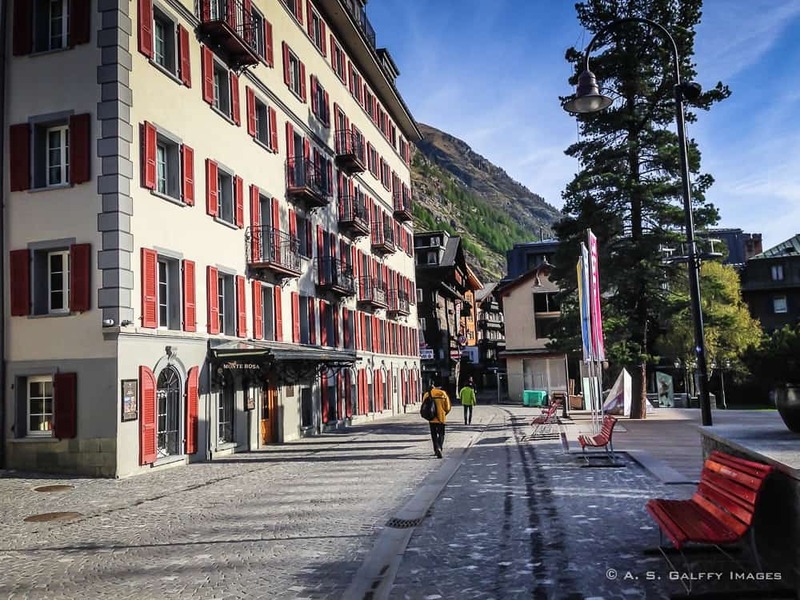 Most of Zermatt’s hotels are family-run and are particularly clean and well appointed. You must be very unlucky to hit one of the less agreeable accommodations. We have been the guests of Romantik Hotel Julen, one of the old, traditional hotels in Zermatt located across the river just off the main street. The hotel has great ambiance, with authentic Swiss furniture and two superb restaurants. They serve an excellent complimentary breakfast with a wide selection meats, pastries, breads, cheeses, jams and fruit. Our room had a beautiful balcony with view of the Matterhorn, which was a big plus for me as I wanted to catch the first sunlight hitting the giant peak. If you are looking for more popular places to visit in Switzerland, read this post about how to spend one day in Zurich. Zermatt looks charming! It's so small and yet has more than 100 restaurants -- that's amazing! What would draw me to visit is the scenery, the hiking, and those adorable goats! Your photos are lovely! Food is excellent in Zermatt, but the scenery is so much better! Zermatt is so pretty - can't wait to visit ourselves! Good to know about the electric taxis. It's especially dangerous in an otherwise completely pedestrian village where you get that false sense of not needing to worry about cars. That said, I wish more small towns and villages would ban cars. It's just so much more enjoyable. Thanks for the tips - pinning this one for later! My husband and I visited Zermatt some 30 years ago on my first trip to Europe. We stayed at the Hotel Butterfly in town and enjoyed skiing, some of the most delicious food up on the mountain and in Zermatt and even went ice skating. Then last year my son and his fiance were on a 3 week European trip and they called us from Zermatt - and were staying at the Hotel Butterfly. Kind of a deja-vu! I loved Zermatt and would love to go back and visit anytime. Looks like you had a delightful visit with lots of fun and good food. Yes I did, Jill. I loved Zermatt, but visited it in spring. I'm sure in winter it's even more charming. It's always been a dream of mine to also go to Zermatt, but I also can't decide when to go - covered in snow, despite not skiing or during the summer/autumn months! Now that I actually know there are plenty of things to do for non-skiers, I have no objection to the latter! If you don't ski, it's no point to go in winter. We went in May, their shoulder season and didn't have to fight the crowds. Zermatt is beautiful at any time of year, but is very expensive. I'd love to visit Switzerland and Zermatt looks great! It is sad that so many climbers die on the way down the mountain. It is as if they have used up their last strength in getting to the top. I have read that the same thing is true of Everest - many more people die on the way down than the way up. I often visit cemeteries when we travel but some are much more sad than others. This would definitely be one of the sad ones. p.s I love the goats. Thanks, Lyn. Very unusual, aren't they? I am so in love with this place. I have been to Switzerland only one and remember how breathtaking the scenery was. In a way, it is very similar to the beautiful Austrian landscapes. I would send my time hiking and seeing as many mountains as possible. Those goats and sheep are super cute. Recently, I read an article about black-nosed sheep living on a farm in Ojai but not sure if they are this breed. I'd be curious if they are the same breed, Ruth. From all they told is in Zermatt, those sheep are very specific to that region. I find that towns in Austria and Switzerland (and the south of Germania for that matter) are just as pretty in summer as they are in winter, such lovely nature and very good value for money too. Love the look of that food! This is one for me since I'm not much of a skier. Absolutely beautiful! I agree, Jessica. Switzerland is really expensive, but quite beautiful. I hadn't heard of Zermatt, but it looks lovely. I can't believe such a small town has so many restaurants. Looks like you ate really well. Yes, Zermatt is still car-free and is as beautiful as ever. Thanks for taking time to comment on my post. Love the pictures and the images. That goat looks so cute and this type of small town is very interesting to visit. Thank you for sharing. That is cool that they have old gravestones for those that have died on the mountain. It's a good way to commemorate those who died doing what they loved, and the quote on the 17 year old American sort of shows that. Also, it's interesting to see that most of the deaths were caused on the way down, not up. 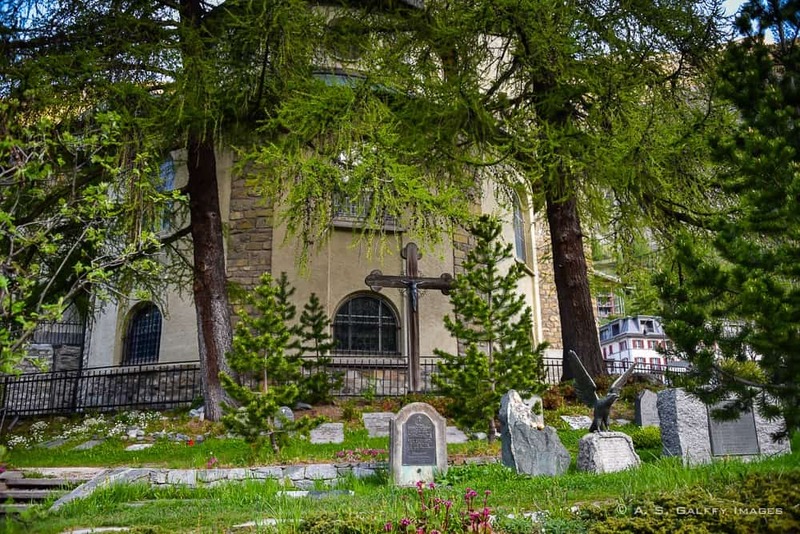 The cemetery in Zermatt is a sad place because most of those buried there are young people. Anda! Lovely! It reminds me a little of the Bavaria, so I really would love to visit it (and this is not just a phrase, I really mean I'd love to visit it :) )). Also the idea of car-free village sounds interesting. I'm not even talking about the air pollution and traffic, but as a person born in the small town in the mountains I suffer much from noise pollution in all the big cities. Many of my friends who were born in the cities don't pay attention at all to such things, for them it's just a "normal background noise". For me it's painful, so the idea of car-free space sounds like a heaven for me :) I'm sorry I do not participate in the Weekly Postcard recently, but I'm traveling during the weekends without my laptop so... I'm mostly offline ;) One thing to consider - I didn't know where exactly Zermatt is, so I googled it, but maybe you could think of a map plugin (or link to a map) which would show the location of the place you're talking about? Just food for thought. Have a nice day Anda! Thank you, Isabella. I'm really glad to hear that my post incited you to travel to this area of Switzerland. In my opinion, this country's scenery is the closest thing to Paradise. The idea of a car free village sounds lovely but I know what you mean about electric vehicles. They can be quite dangerous. I seem to remember someone suggesting once that they all be required to make some sort of noise, like playing Mozart or something, to make them safer for pedestrians. It is interesting that most of the deaths of the climbers were on the way down. I believe Everest is much the same - getting to the top is not the hard part. The hard part is doing so in a way that allows you enough energy and daylight to climb down safely. It is sad to read headstones of young people though. Yea, I found that detail interesting too,Lyn. You'd expect the climbing up to be more difficult and dangerous, but it seems it's the other way around. Wow beautiful, I had forgotten how stunning the alps in Europe are, meanwhile my son would love riding the train up. Ohhhh... that lamb loin looks delicious! I've heard of Zermatt. Did not know that it's car-free. Yet one more incentive to visit. 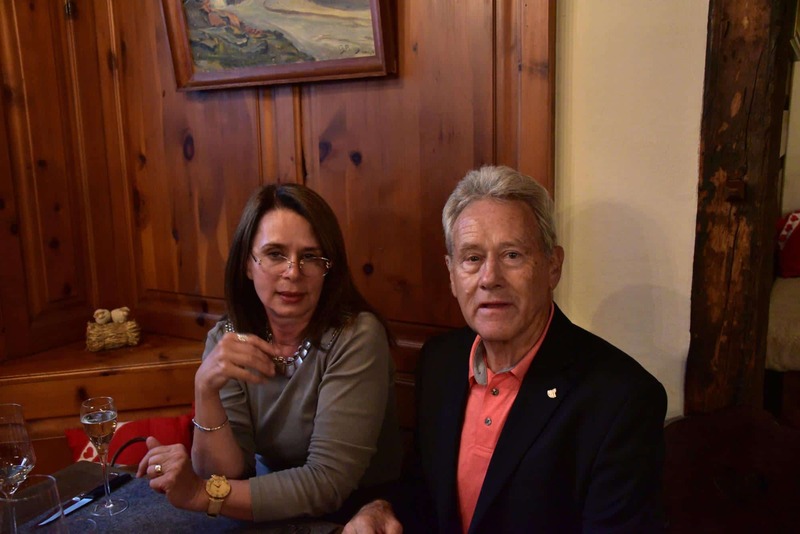 The Swiss cuisine is absolutely delicious, Linda, and the scenery is astounding. I think you'd love Zermatt. It looks so chocolate-box pretty! And the green of the mountain grass is amazing. Oh my goodness, are those goats and sheep ever adorable! Thanks for the guide - I wouldn't be able to get over how beautiful the mountain looks! I loved those goats and sheep too. They are so cute, I could keep them as pets. For a small town, there are a lot to do in Zermatt. And, if there is good food, I can see myself staying a couple of days. Enjoyed all your descriptions about the food you had there. The lamb loin in butter looks delicious.